This is the story of putting together some clues about the Murdocks of Pictou, Nova Scotia and developing a solid idea of who the family was. In my continuing search for Rachel, the mother of my great great grandmother Jessie Ruth (MacLeod) Murdock, I have been investigating an idea that she was in fact related to her father-in-law, William Murdock. Both were from Pictou, Nova Scotia, and I am finding very little other evidence of how or why a single young woman came to Providence from Pictou. 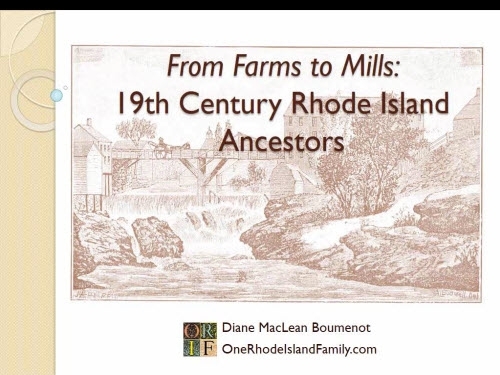 I have previously described the MacLeod family that had adopted her in Pictou, and my investigation of the Murdocks’ surprising lives in Providence. Now, it’s time to trace the Murdocks back to New Glasgow, Pictou, Nova Scotia. Some Murdock farms are shown on this 1864 map of Pictou County, just north of the town of Pictou. The town of Pictou is not far from New Glasgow. 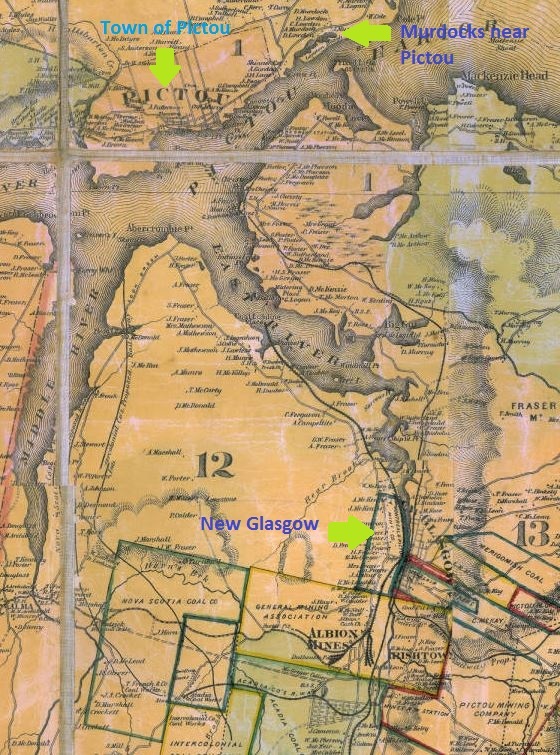 Lorne, where Jessie MacLeod lived as a teenager, is beyond the edge of this map, south of New Glasgow, and slightly to the west. Map courtesy of novastory.ca. 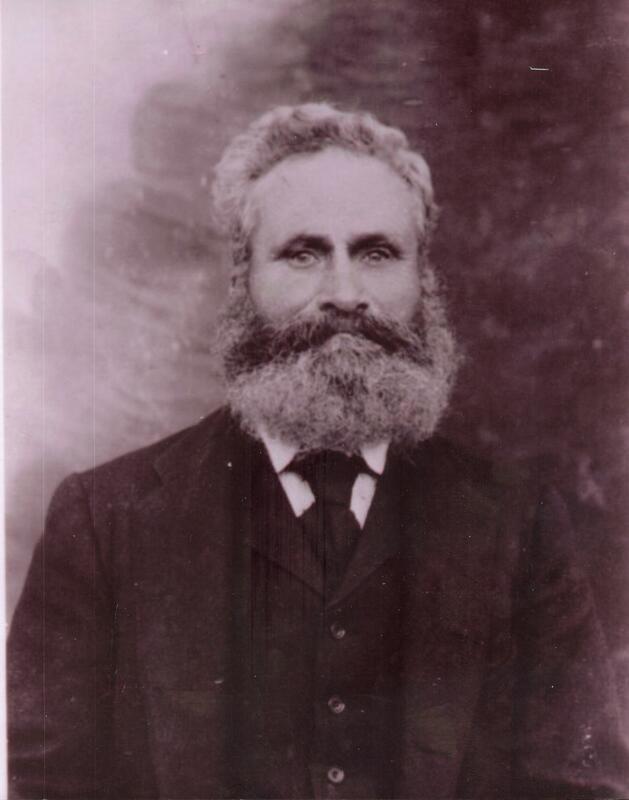 William Murdock, shoemaker, later expressman and farmer, born 25 Dec 1825 in Pictou, died 1890. According to his Providence marriage record (to second wife, Maggie) and his death record, his parents were Robert and Mary. his wife Eliza Coghill, (or Cogill, Caghill, Cahill) Murdock, born approx 1832 in Nova Scotia, died 1864 in Providence. She had a possible brother nearby in Providence, Daniel Coghill. Thanks to the children’s names I clearly had some helpful evidence to pursue in Pictou records. The websites www.NovaStory.ca, Pictou County GenWeb and The Genealogical Association of Nova Scotia were helpful in my search for sources on the Pictou area. I quickly realized there was not going to be much previously compiled work on the Murdocks or Coghills/Cahills for me to look at. I was building the evidence myself. Several books provided some further clues but no real answers. 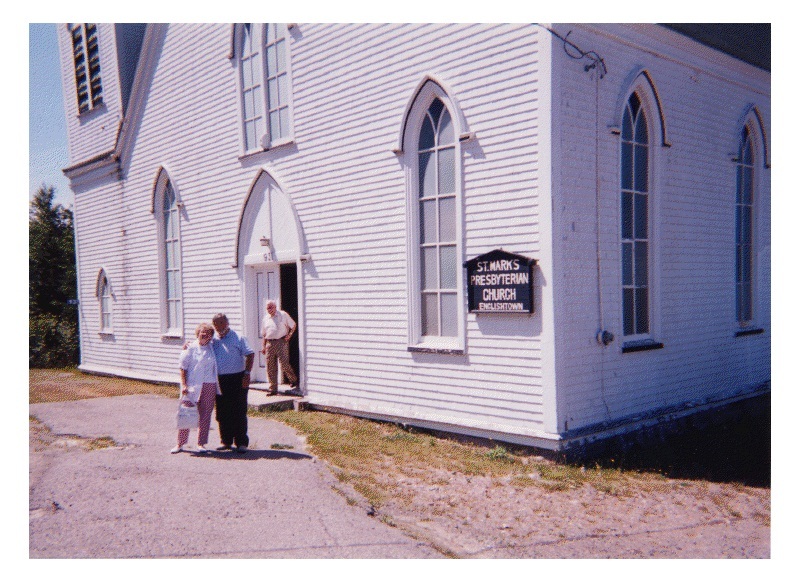 History of the County of Pictou by Rev. George Patterson, 1877 (I have the Mika Studio reprint, 1972) and its typescript index by Robert Kennedy (published by the Pictou Academy Educational Foundation, 1975) mention William Murdoch (someone too old to be MY William Murdock) twice: once, in a map of the town of Pictou circa 1793, and again, in a list of money owed in 1803 for the building of a bridge in Pictou. Plan of the town of Pictou, 1793, from History of the County of Pictou by Patterson, p. 160. Rev. John L Murdock, uncle of William Murdock, from Pictonians at Home and Abroad, p. 34. Pictonians at Home and Abroad by Rev. J. P. MacPhie (Boston: Pinkham Press, 1914) recounts on page 34 the story of Pictou Academy, begun in the 1810’s, with rigorous educational programs. John L. Murdock trained for the ministry there, and was later awarded an M.A. degree from the University of Glasgow (p. 34 & 35). He served as a Presbyterian minister in Windsor, Nova Scotia for many years. — — son of William Murdock of Truro and Pictou Town, shoemaker. 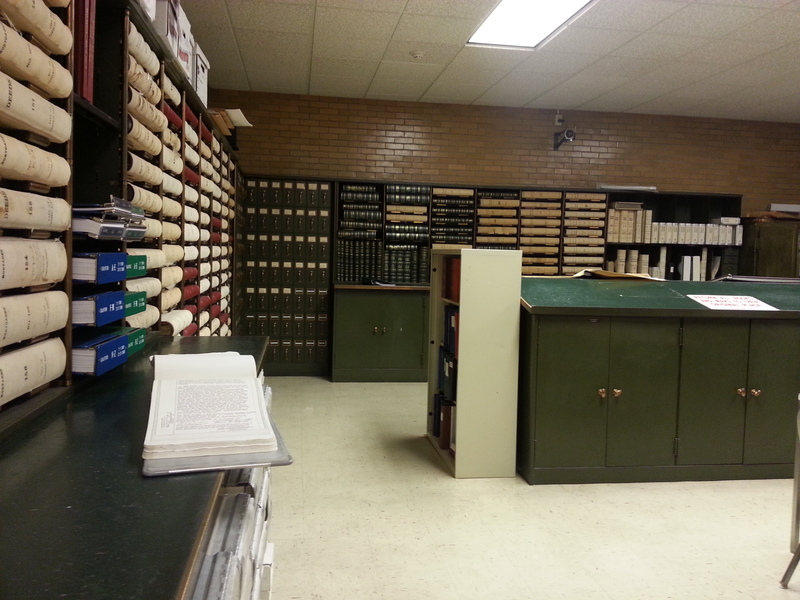 I was able to see some deeds on microfilm at the New England Historic Genealogical Society. The first was badly written and reproduced, but shows the children and widow of the elder William Murdock, who died in 1830. 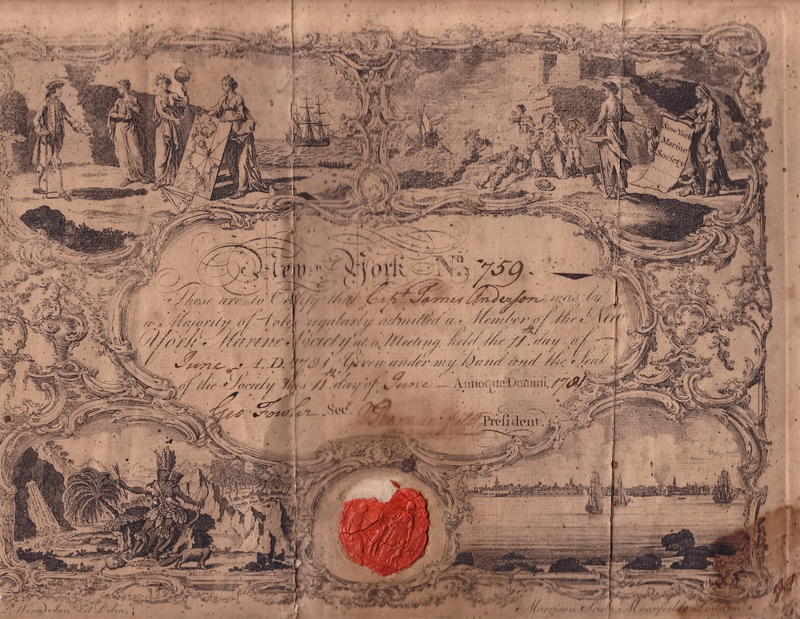 “This indenture made the seventeenth day of January … 1831 … between Robert Murdoch of Pictou … Blacksmith … and Mary his wife of the one part & James Murdoch of Pictou … Tinsmith of the other part.” William Murdock, James Murdock, and “Mrs. Murdoch the said Robert’s Mother” (also called Mrs. Jane Murdock in other spots) are abutters. — Nova Scotia, Pictou County Land Records. Deeds, v. 13-14, 1829-1831. Volume 14, p. 341-343. In the 1855 deed, Robert, blacksmith, had purchased some land at auction from the estate of Ann Freeman. In this one his wife was recorded as Janet, which matches the second marriage record I have found. On the next page, a deed is recorded selling this same property to Richard Clark Murdock, blacksmith (would be his son, brother of the younger William Murdock). James McIntosh is a witness. — Nova Scotia, Pictou County Land Records. Deeds, v. 39-40, 1854-1855. Volume 40, p. 258-260. There are many more deeds to explore, but these begin to help me match up all the various pieces of data I am finding. You truly never know where you will find an answer to a family history puzzle. In this case, I found it in a book of poetry. It was only when I put the book information together with the names, above, and the deeds, above, that it brought the whole solution into clarity. A Complete Work of Robert Murdoch, P.L.P., containing his Poems, Songs, Toasts and Epigrams, with a sketch of the Life of the Poet from his school days up to the time of the publication of this work. (Halifax, N.S. : W.M. McNab, 1890). Robert Murdock, Jr, poet and brother of William Murdock. He omits his mother’s, father’s and sisters’ names. When he says his mother left him and two sisters, I believe he meant AT HOME. 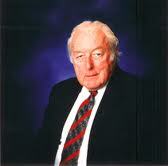 Later, he specifically mentions another brother, Richard Clarke Murdoch. The name of his grandmother Rachel jumped out at me, since I am trying to find out if William’s family could contain a younger Rachel. The name of his grandfather, William, seemed like another possible link to my William Murdock. … my father got married to Janet Gordon, of Gairloch, and I can, with the greatest truth and pleasure, say that she was one of the best stepmothers that was ever put over orphan children ; my mother, I say with truth, never treated me nor my little sister better. I firmly believe had she been more harsh and severe it would have been better for us both ; but it was not her nature, she being always of a quiet disposition. This quote, above, seems like something you might say, looking back after many years, about a sister who had a baby while unmarried, which is what I suspect Rachel’s situation was. The town of Pictou 50 years after William Murdock left – 1914. From Pictonians at Home and Abroad. The oldest daughter was Mary Tanner Murdoch, and I knew William’s mother was Mary, but I did not instantly suspect that his mother was Mary Tanner. Mitch gave the basic outline of this to me about a year ago. Not sure why it took me so long to find a little more backup and examine the whole thing. Find the children of each of William Murdock’s siblings, to see if Rachel is among them, or look for any links from the Murdocks to the MacLeods. Look for a will or probate record for William Murdock’s widow, Maggie (Lawrence) (Murdock) Knight who died in Providence, Rhode Island in 1921. Follow up with the Public Archives of Nova Scotia on a court case I found in The Journal of Historical Geography 30 p. 70-86 footnote 91 (Katie Pickles, Locating widows in mid-nineteenth century Pictou County, Nova Scotia): PANS RG 39 C Vol. 2 #16 Queen v. Murdoch, July 23, 1862. Look at Pictou deeds for further information about the earlier William Murdock and any possible parentage. follow up on 1855 deed witness James McIntosh, since I am wondering why one of William’s daughters has the middle name McIntosh. 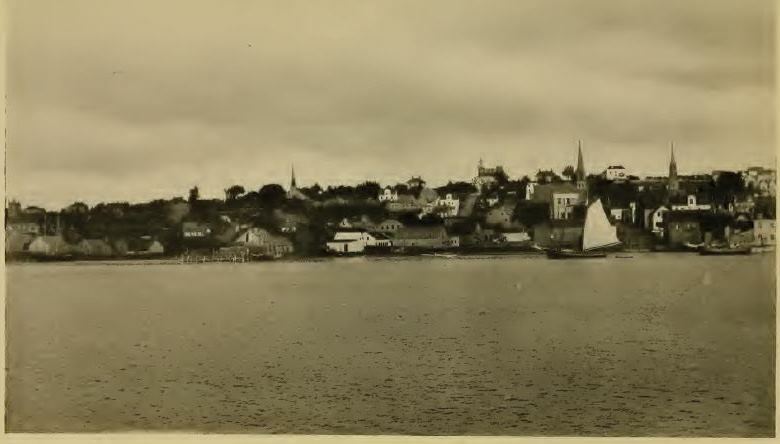 View of New Glasgow from the East River, 1916, from Nova Scotia’s Industrial Center, p. 94-95. It is quite industrial at this point, and in 1860, when William Murdock came to Rhode Island, it was already showing the beginnings of this build up. 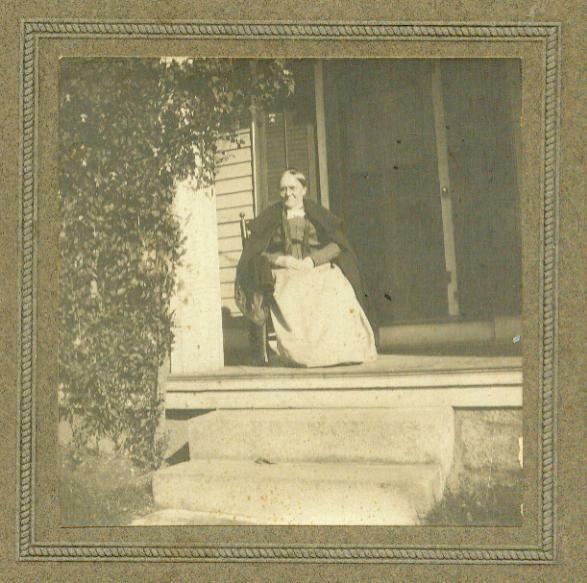 My great-great grandmother Jessie Ruth (MacLeod) Murdock was born in Pictou, Nova Scotia around 1861. 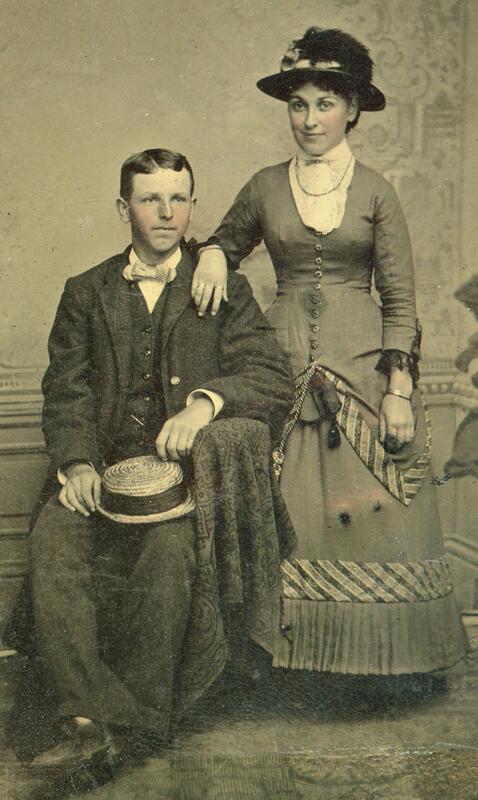 She came to the United States as a teenager and married, in 1883, Louis Rufus Murdock, my great-great-grandfather. They had three daughters of which my great grandmother, Eva Louise (Murdock) Darling, was the oldest. Louis and Jessie Ruth (MacLeod) Murdock. I assume this is around the time of their wedding, 1883. Jessie and her husband Louis present some special challenges for the family historian. Lewis was always known to be adopted, in Providence, R.I., by William and Maggie (Lawrence) Murdock. And Jessie, although known to be from Pictou, was hard to research, and I had no evidence about what might have brought her to New England. Her father was listed on her marriage record as William MacLeod, and her mother, as Rachel. Although I was unable to find such a family in Pictou, I discovered that William Murdock, Louis’ adopted father, was from Pictou. That seemed like it might be too much of a coincidence, but still, I couldn’t make much of it, because the name William Murdock is about as hard to pin down in Nova Scotia as William MacLeod was. My first big break came in 2012 when a 5th cousin on the MacLeod side contacted me to let me know about a family history book published by Jessie’s nephew, in Pictou, in 1958. That post is here. But imagine my surprise when the book claimed that Jessie was adopted by William MacLeod and his wife, Mary. And yet, since she was pretty clear on her marriage record that William MacLeod was her father, and Rachel her mother, and since she had been missing from William and Mary’s 1871 Canadian census record in Hopewell, Pictou (when she would have been around 10 years old) I can only assume she was related to these people in some way, and perhaps she had spent her early life with her mother, Rachel, before arriving in the William and Mary MacLeod family, for whatever reason. William and Mary lived and died in Pictou and never relocated to the U.S. So clearly, Jessie had other connections somehow, somewhere. This is an unusual case where I think my best bet for unlocking Jessie’s story is through her father in law. I wonder where William Murdock was from in Pictou, and if he had any relations named Rachel. No birth place or point of origin has surfaced in my direct research on him. So I am going to try and locate all his children, hoping that their c1900-1920 death records will give some additional information. Ironically, I do not believe I am related to William Murdock at all through his adopted son, Louis. I have a theory that Louis may be Maggie (Lawrence) Murdock’s relation showhow, but that’s a story for another day. William Murdock was born on Christmas day, 1822, perhaps in Pictou, Nova Scotia, the son of Robert and Mary Murdock. He married Maggie Lawrence in Providence in 1865. He was a shoemaker, but later worked as an expressman, and finally, in 1880 purchased a small farm in Seekonk, Massachusetts. Looking at the 1870 census record, you can see William and Maggie with 3 children – Annie (11), Louis (7) and William (3). Only William Jr. was born after the marriage, and since Louis always said he was adopted, I wondered if the couple had married a little late in life and adopted two children, and also gave birth to one. 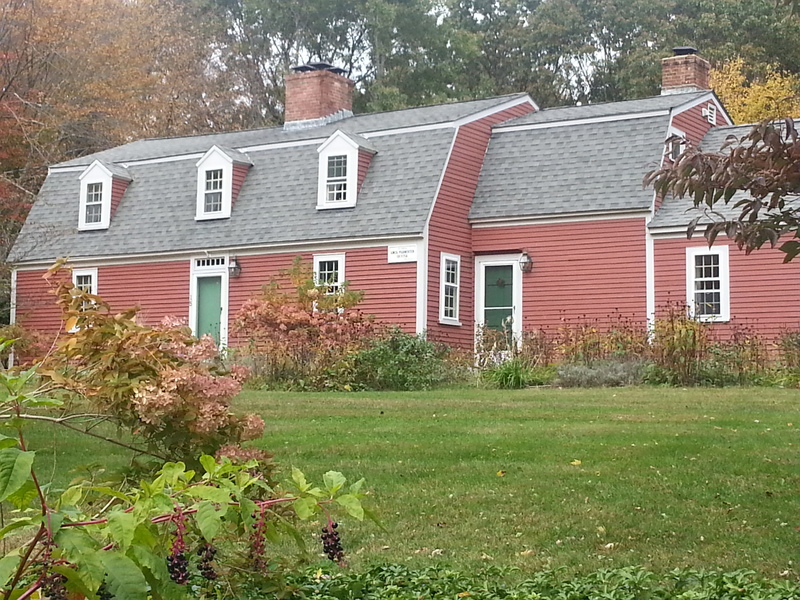 This is a family photo of, I believe, William and Maggie Murdock’s modest farmhouse in Seekonk, Mass. My great grandmother was born there. 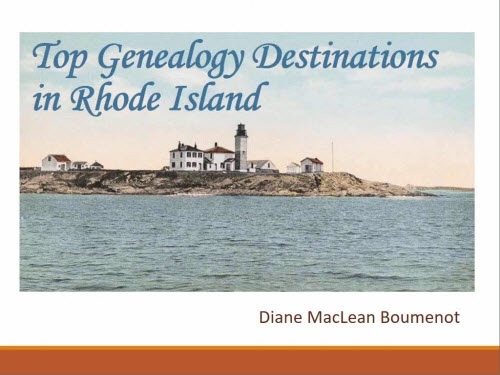 There were several William Murdock families in the Rhode Island area around this time, and it took many, many clues before I put together that William had another marriage before marrying Maggie. My first solid clue about other children in William’s household came when I discovered the 1875 R.I. state census record for William Murdock. The three children I knew about were there, plus another, Jessie. Jessie was given as a 15 year old daughter in the Murdock family, born in Nova Scotia. It occurred to me briefly to wonder if she was my great-great grandmother, a cousin perhaps, arrived to live with the family from Nova Scotia and misclassified as a daughter. 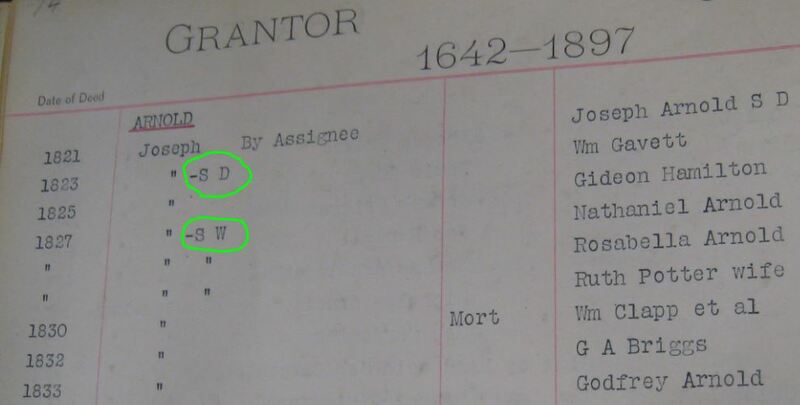 I finally found the 1860 census record for the family, which was mis-indexed in Ancestry.com as “Mondock”. The parents are William and Eliza Murdock. There are four daughters: Mary (11), Martha(8), Anna(4), and Jessie(5/12). They were all, even the baby, born in Nova Scotia. If accurate, that gave a good indication of a recent arrival in the U.S.
Once I had the children’s names to search for, I quickly located an immigration document on Ancestry.com. It was in the U.S., Atlantic Ports Passenger Lists, 1820-1873 and 1893-1959 (Rhode Island, Providence). On June 19, 1860, William (occupation Shoemaker), Eliza, Mary, Martha, Ann and Jessie Murdock arrived in Providence, Rhode Island on the Brig Diamond of the Deep from Pictou, Nova Scotia. Part of deed selling share of William Murdock property to widow Maggie in 1891. Since the Massachusetts Land Records collection came online on FamilySearch (unindexed, but browsable) I have been pulling some out and filing them on my computer. So when I reviewed my Murdock files I realized that a deed that had been hard to understand 6 months ago was now very clear. In 1891 the widow, Maggie, was given, for the price of one dollar, the other half of William Murdock’s property in Seekonk, Massachusetts (see my post on finding that property, here). The sellers were Peter King, his wife Martha King, Alick Holmes, his wife Jessie Holmes, Mary Foster (all of Newport, R.I), and William C. Murdock. The property described was identical to, and referred to, the deed I had found for William’s purchase. Angus MacLeod was a witness. So I now had evidence of William Murdock’s six children and two wives. With the evidence already mentioned in hand I thought I could quickly find some details of their lives, looking for middle names and especially death dates so I could find their death records at the Rhode Island State Archives, looking for their exact birthplace in Nova Scotia. However, this was not quick, because their lives were absolutely fascinating. William’s first wife Eliza (Coghill) married him in Nova Scotia and they had four children by the time they came to Rhode Island in 1860. They settled in Providence, where William pursued his occupation, shoemaking. Eliza died in 1864 in Providence, of consumption. Margaret A. (Lawrence) Murdock, known as Maggie, was William’s second wife, married in 1865. Reportedly born in the south around 1838, the daughter of English immigrants, Margaret was living with her parents in Providence in the 1865 Rhode Island census, and when she married William shortly thereafter the marriage record listed her as “divorced”. Margaret and William were married until his death in 1890. After that, Margaret married once again, in 1898, to Seekonk neighbor Jeremiah Johnson Knight, a 68 year old man whose second wife had died, leaving him with a couple of young children. They were only married two years before his death, and during that time he may have been ill. Maggie lived until 1921. Born in 1849, oldest daughter Mary was 11 when the family arrived in Providence. She would have been 15 when her mother died. She married young, to Theodore W. Foster. Theodore was a talented and hard working entrepreneur, with an interest in the manufacture of jewelry, a growing industry in Rhode Island. Theodore and Mary settled in Pawtucket, and soon he was able to start his own manufacturing company, with some partners: White, Foster & Co., later Foster & Bailey. By 1899 he bought the partners out and renamed the company Theodore W. Foster & Bro. Co. The company, at 100 Chestnut Street was a major manufacturer of silver giftware such as jewelry, trays, pins, shoe horns, vanity sets, and desk accessories. Along the way Theodore, always the inventor, secured dozens of patents, and instituted a cleaner and safer work environment. His beautiful products can still be purchased, as antiques, on the web. Mary, Theodore and their family of five children enjoyed growing wealth and prominence. And then something very strange happened. The family moved to Providence, and attended the Methodist Church on Chestnut Street. The couple was very friendly with the handsome minister, Rev. Charles L. Goodell, and his wife, Louella. Theodore was director of the Sunday School. When Mr. Goodell was assigned to his next church, the Trinity Methodist Church on Broad Street, the Fosters obtained a pew and switched their membership there. In 1886, newspapers in the eastern U.S. were reporting that Mary was being sued for divorce by Theodore, on the grounds of her affair with the minister. In fact both couples filed for divorce and the cases were heard in the Rhode Island Supreme Court during the same week in 1887; Theodore Foster obtained his divorce, but Louella Goodell, wife of the minister, faced counter-claims of infidelity and her divorce was denied at that time. The Methodist church exonerated Rev. Goodell and he did not lose his job. 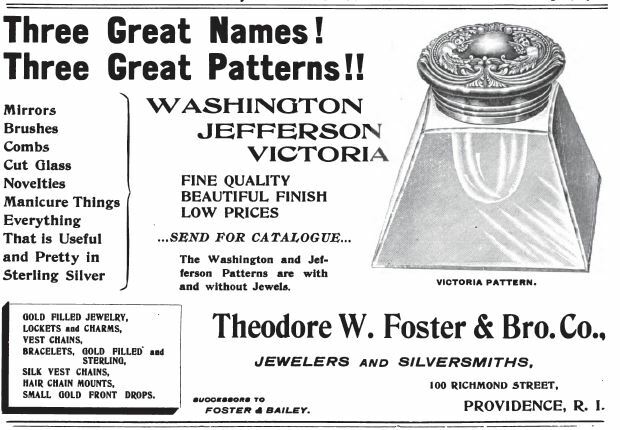 In that parish was Mrs. Mary T Foster, a preposessing lady, whose husband, Theodore W. Foster, is of the manufacturing jewelry firm of Foster & Bailey. Mrs. Foster lived in elegant style at the corner of High and Brigham Street, her house being richly furnished throughout with every comfort at command. She had a most interesting family of children, lovable and attractive, and many an envious eye was turned toward their carriage as it rolled along toward the Chestnut Street church Sunday mornings. The Goodells and Fosters became very intimate, as Mr Foster was superintendent of the Sunday School and Mrs. Foster was prominent in church work, and between the two families of bond of friendship appeared to have been formed … — Boston Herald, September 2, 1886, p.5. A home at the corner of Bridgham and Westminster (formerly High) Streets, Providence. Any 1880’s houses from the other corners of the intersection are now gone. This could have been the Fosters’ home, or not. Photo by Diane Boumenot. One day Mr. Foster told his story to the newspapers. “My wife”, said he, “began to act queerly. She seemed disturbed, and said that she had a confession to make. With amazement I heard her story. She told me that she had been unfaithful to her marriage vows, giving the name of Dr. Goodell, my pastor and my bosom friend, as her paramour. I was thunderstruck. I took her face in my two hands and begged her to say no more then. Mary, said I, let me think … let me think over it. From that hour she ceased to be my trusted wife and companion. She besought me piteously to condone her sin, but I told her that henceforth she might occupy our residence, but we must be as strangers.” — New York Herald, December 19, 1886, p. 8. Theodore remarried in 1894. I am unsure of what became of Mary after her divorce. There is some evidence she went to her sister in Newport, and may have remained there since she was “of Newport” when she signed the 1891 deed, above. The Rhode Island Historical Cemeteries Transcription Project has Mary T. Murdock Foster, 1848-1899 buried in the North Burial Ground, Providence. Her death record at the R.I. State Archives indicates that she died of “La Grippe” (flu) on February 12, 1899 in Rodondo, Los Angeles, California, age 50. Theodore W Foster & Bro. Co. Plant, Providence, from Biographical History of the Manufacturers and Businessmen of Rhode Island (Providence: J.D. Hall, 1901). Born in 1852, Martha arrived in Providence at the age of 8. In 1878 she married Peter King, a Scottish immigrant who was a rising clerk at The Boston Store in Providence. Around this time Peter King and a fellow clerk, Angus MacLeod (also a Scottish immigrant, from Lewis) decided on Newport, Rhode Island as a suitable spot to open a dry goods store of their own. They named it The Boston Store, (see a photo of the store here) but the was no real connection to the original Boston Store. The King-MacLeod partnership thrived, encompassing the popular and growing department store as well as some other interests. The Boston Store was, eventually, located at 153-157 Thames Street, Newport. Peter King and Angus MacLeod (who was witness to the deed, above) became financial leaders in the Newport community, chairing the boards of many leading institutions and participating widely in church, hospital, political and fraternal activities. Martha and Peter had nine children, and sent many of them to college, and several of the boys pursued business interests begun by their father. They owned a beautiful Victorian house at 10 Kay Street, Newport, near Touro Street and the Hotel Viking. Peter died in 1932 and Martha passed away in 1940. 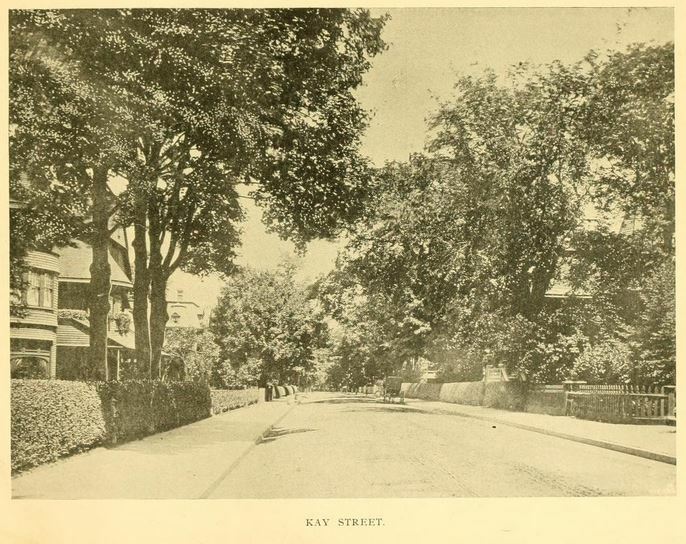 A view of Kay Street, Newport, c1905, from Newport and Its Points of Interest, page 21. Annie was born in Nova Scotia around 1855 and arrived in Providence at the age of 5. In the 1865 R.I. State Census, at age 9, she and Jessie Murdock were living on Mountain Street near Atwells Avenue in Providence, in the home of Daniel and Hannah Coghill, both age 37, and Thomas A Coghill, age 17. All household members were born in Nova Scotia. Since Coghill was their mother Eliza’s name I can only assume the two sisters were staying with relatives after their mother’s death in 1864. Annie appeared in the 1870 and 1875 census records with William and Maggie. By 1875 she was 19, but not working, which is a little unusual – many daughters in my family at that time clerked in stores, or packed jewelry. In 06 May 1876 this item appeared in the Providence Evening Press: “DIED. MURDOCK – In this city, 6th instant, Annie Murdock, daughter of William and Elizabeth Murdock, in the 21st year of her age. — Funeral on Monday, at 2 o’clock, from 192 Clifford Street. – Nova Scotia papers please copy.” The Providence death record gives the age as 20, and the mother as Eliza. Jessie was an infant when the family arrived in Providence in 1860; in fact her birth in Nova Scotia was so recent that the parents entered it on the birth records of Providence (found on FamilySearch.org). The town cited was “New Glasgow” in Pictou. In 1875 Jessie was living with William and Maggie on Spruce Street in Providence. In January 1880 she married Alexander McIntyre Holmes, a wheelwright, originally of Prince Edward Island. By the 1900 census the family had six children. They spent their married life in Newport and in 1919, when Jessie died, the family resided at 9 Newport Avenue, Newport. My great-great grandfather Louis believed himself to be adopted. Louis married Jessie Ruth MacLeod from Pictou in 1883, and they had three daughters. Louis worked for 50 years as a machinist at Brown & Sharpe, a machinery company in Providence. I have no idea what his relationships were among these relatives mentioned here. Since Maggie Lawrence’s father was a machinist, I suspect Louis got his start in life from that grandfather. William and Maggie Lawrence had one child after their marriage, William Clark Murdock, born 1868. William Clark, a silversmith, married Susan Lydia Fairfield in Seekonk in 1894. They had three sons and divorced shortly after 1900. William must have been fond of his brother, Louis, because he named his third son after him, Louis Rufus Murdock, born 1898. In 1910 William Clark was living at 101 Mitchell Street in Providence (the address today is an older, nondescript, narrow 2 family house on a small lot near Elmwood & Potters Ave.) with his mother and a boarder. His son Earl Forrest Murdock graduated from high school in 1913, and from the Rhode Island School of Design in 1915 (according to Earl’s obituary in the Springfield, Mass. Union-News, 21 Nov 1992; Earl lived a long life in Franklin County, Mass. and left many descendants). In 1915, the state census showed William Clark living with sons Earle and Louis, and with niece (brother Louis’ daughter) Chris, and her husband, Charles Faulkenburg. In 1920, he was still on Mitchell Street with his mother and sons Earl and Louis. In 1920, his son Louis was employed as a student in a dental office. In 1930 William Clark was running a boarding house on rented property on Beacon Street in Providence, with son Louis living with him, no employment listed. Sadly, the younger Louis spent the 1930’s as an inmate in the Rhode Island State Hospital for Mental Diseases at Sockanosset in Cranston. William Clark Murdock died in 1933. There is one more Jessie Murdock, who was Jessie and Louis Murdock’s daughter Jessie Ellen Murdock, born 23 December 1889 in Providence. Jessie, known to my mother as Aunt Jay, married Alonzo Daniel Billington (Uncle Lon) in 1911. They had no children, and Jessie died too young in 1939. Jessie Ellen Murdock Billington, 1889-1939. I’m not sure if I have checked well enough for a probate record for William Murdock. I would like to see Jeremiah Johnson Knight’s (Maggie’s third husband) probate records. I wonder where his children went after his death. A visit to the R.I. State Archives may reveal the remaining middle names and I am hoping to see a place of birth on several death records to really feel confident that I know where the family was from (possibly New Glasgow in Pictou). With all this new information, move on to the Nova Scotia portion of the research. Knowing, now, of a possible sibling for Eliza Coghill Murdock will help. I think the next post on this subject will be about William’s parents, Robert and Mary Murdock, and Eliza Coghill’s family, and any connections I can find to a Rachel who might be Jessie MacLeod Murdock’s mother. Head south with my research and explore the early life of Maggie Lawrence. There is evidence they lived in several southern states before arriving in Rhode Island; perhaps their lives were disrupted by the civil war. Through the blog, I recently met a fifth cousin, which wouldn’t be so unusual except that he is related to me through my great-great-grandmother Jessie Ruth (MacLeod) Murdock, that I had never found a family for. She is related to me in the following way: my grandmother Edna Darling — her mother Eva Louise Murdock – her mother Jessie Ruth MacLeod. Jessie Ruth MacLeod was born in Pictou, Nova Scotia, around 1863. My grandmother told me that many years ago, but since starting genealogy, I’ve never been able to expand on that knowledge. One day in December, I was contacted by a distant cousin, Alex R. MacLeod IV, who told me about a local history/genealogy book, from Pictou, that mentioned Jessie, her husband, and her daughters, and was written by Jessie’s nephew. There was no mistaking Jessie’s entry. Emails from Alex, and my subsequent purchase of the book, clarified a great deal for me. And, of course, raised more questions. The one thing I am quite sure of is that Jessie was the daughter of William MacLeod. It may take years to discover exactly who her mother was. William MacLeod was born in Tea-Gate, Kiltarlity, Inverness-shire, Scotland in 1823. He was the son of Alex and Annie (Frasier) MacLeod. Alex and Annie brought their children from Scotland to Middle River, and later, to Lorne, Pictou, Nova Scotia around 1832. Another son of Alex and Annie, Archibald, is the one that my cousin is descended from. 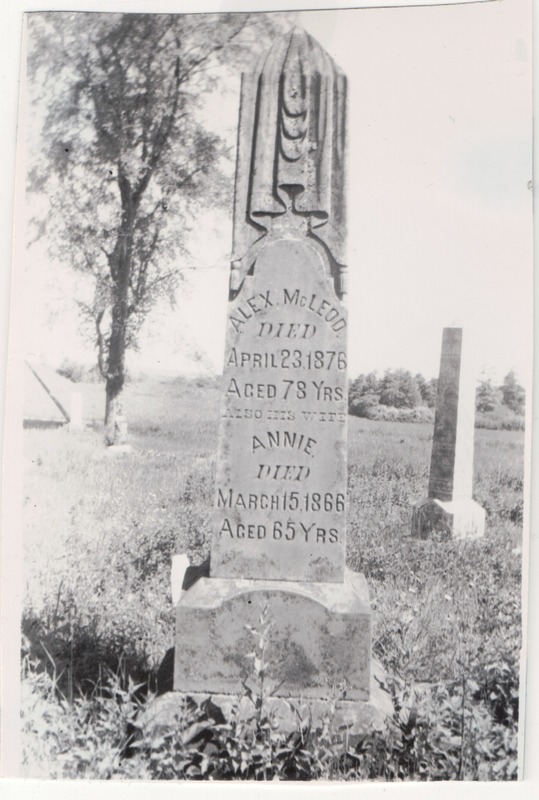 Grave marker for Alex and Annie MacLeod, St. Columba Cemetery in Lorne, Pictou, Nova Scotia, from the collection of Alex MacLeod, used with permission. St. Columba Church, Lorne, from the collection of Alex MacLeod, used with permission. 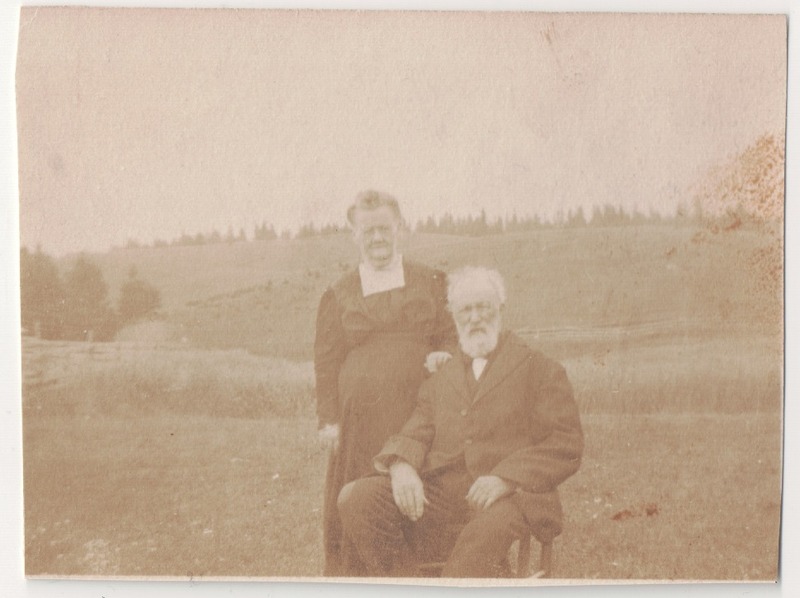 Archibald and Elizabeth MacLeod, probably in Lorne, from the collection of Alex MacLeod, used with permission. Alex MacLeod, my gggg-grandfather who brought his family from Scotland to Nova Scotia in 1832, was born in Tea-Gate, Inverness-shore, Scotland. His parents were William MacLeod and Margaret MacKay. 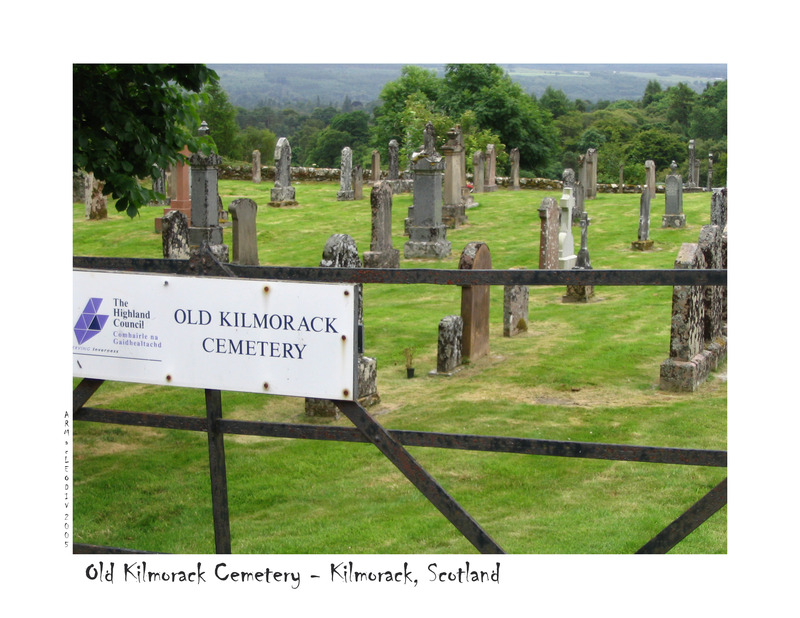 Old Kilmorack Cemetery – Kilmorack, Scotland. Photo by Alex MacLeod. Used with permission. 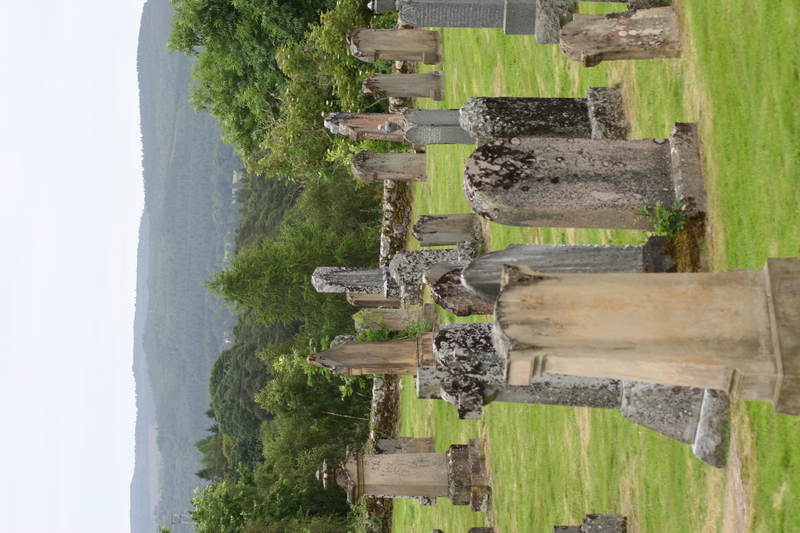 Old Kilmorack Cemetery with “a view of the hills of the Parish of Kiltarlity – probably Beauly – but looking up towards Teagate.” Photo by Alex MacLeod. Used with permission. 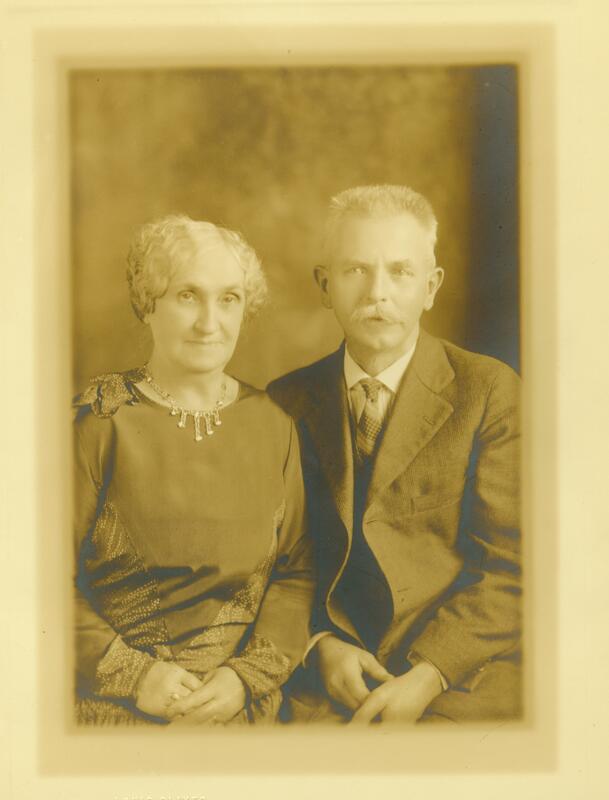 Our ggggg-grandparents, William MacLeod and Margaret MacKay, are buried in Old Kilmorack Cemetery. 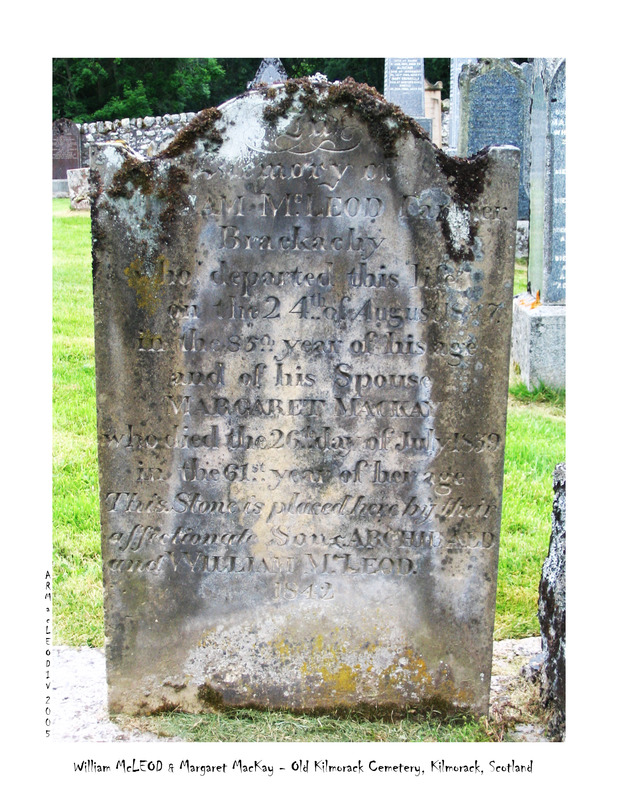 William MacLeod & Margaret MacKay – Old Kilmorack Cemetery, Kilmorack, Scotland. Photo by Alex MacLeod. Used with permission. on the 24th of August 18[4?]7. I would note that the Archibald and William MacLeod that my cousin and I descend from are from the next generation; nephews of the sons that provided this marker. Alex was also able to take some photographs of nearby Beauly, where our ggggg-grandmother Margaret MacKay was born. The River Beauly – Beauly, Scotland. Photo by Alex MacLeod. Used with permission. There are some interesting links between Annie Fraser and some nearby gentry; Alex and I hope to learn more about that someday. 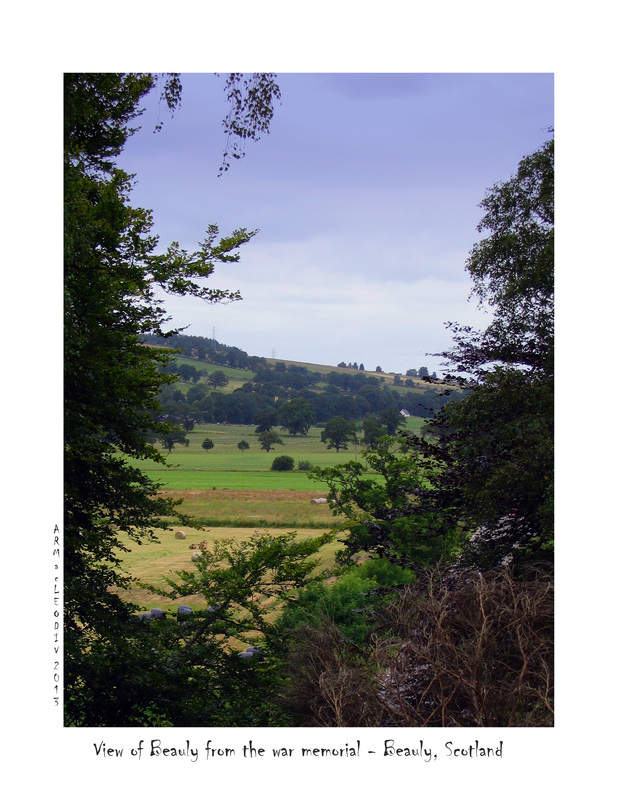 View of Beauly from the war memorial – Beauly, Scotland. Photo by Alex MacLeod. Used with permission. Alex has always had a copy of the book “The Pioneers and Churches” written by my 1st cousin 3x removed, Rev. D.K. Ross (Hopewell, Nova Scotia, 1954[? ]); and over the years Alex has been able to get some expert help locally in Nova Scotia. Those are the sources for the information, above. Thanks to Alex’s kindness in reaching out to share this information I will now be able to further explore Jessie’s roots. Since my recent “How to Solve the Next Ten Problems” post, in which I detailed some steps I planned to take in the next few years to break down some brick walls, one of those has been solved. My great-great-grandmother (my mother’s mother’s mother’s mother), Jessie Ruth MacLeod, was born in Pictou, Nova Scotia, around 1862. She somehow arrived in Providence, Rhode Island around 1881. She married in 1882 and raised three daughters. On her marriage license, she listed her parents as William MacLeod and Rachel. I could never find any real trace of her before her marriage. But thanks to the blog post about the brick walls, and other mentions of Jessie Ruth in my blog, I was contacted by a MacLeod, a fifth cousin. 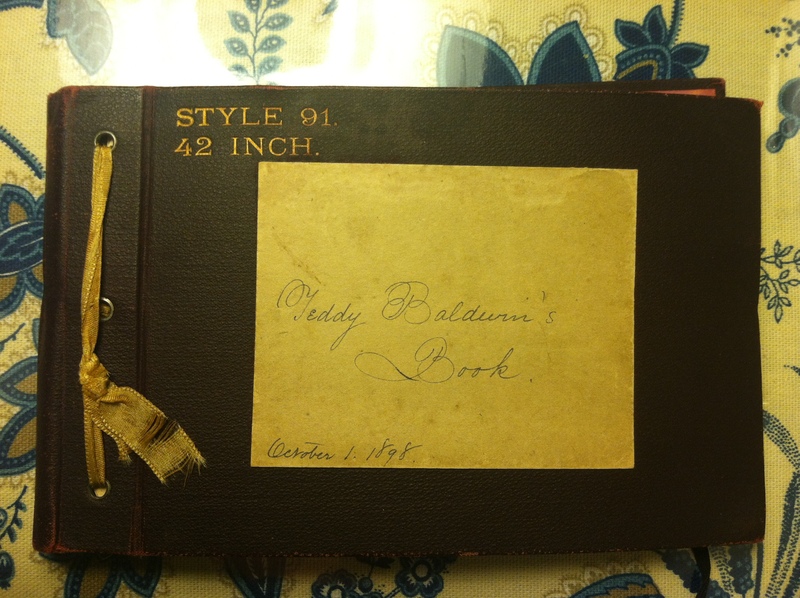 He owned an obscure family history book published by Jessie’s nephew, back in Pictou, around 1958. I now have a copy. For links to downloadable sections of the book, see the bottom of this post. Jessie is definitely in the book, The Pioneers and Churches: The Pioneers and Families, of Big Brook and West Branch E.R. and Surrounding Sections Including Lorne, Glengarry, Elgin, Centerdale, Hopewell, Marshdale, Foxbrook, by Rev. 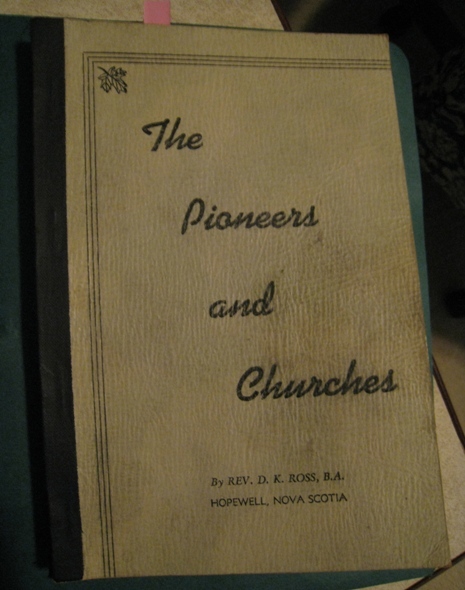 D. K. Ross, Hopewell, Nova Scotia [privately published, n.d.]. I strongly suspect that there is more to this story about the adoption, and that “it’s complicated.” But that’s a problem for another day. In the meantime, here are some details of her family background, at least through adoption. I am taking some liberties using text/images here in the belief that the author, Rev. Daniel Keith Ross, put twelve years into the book and privately published it so that his relatives would know more about their background, and he would want it to be circulated. If any descendants want to object, please come over any time and make your case. And bring pictures. I am only beginning to research this myself, so please be aware I am taking this information from the book, and have only begun to seek further sources. (father) William MacLeod, born 1823 at Tea Gate, Kiltarlity, Inverness-shire, Scotland; arrived with his parents at Pictou in 1832. Married Mary MacLean in 1847, and had one daughter, Christy Ann, in 1848. He lived on his wife’s family farm. Died in 1894 in Big Brook (now Lorne), Pictou, Nova Scotia. from the book, p. 158: William MacLeod, born 1823, married Mary MacLean, born 1823, of Big Brook and settled on the Donald MacLean farm and carried on farming in summer and lumbering in winter. For eleven winters he made his way to Aroostook County, Maine and cut and hewed pine timber to be taken down the St. John River in the Spring. He followed the drives down the river for eleven seasons. River driving was cold and hazardous business. William MacLeod was not only a splendid axeman, he could hew the line with a broad axe and also use the narrow axe to good effect. He had a set of carpenter’s tools and made horse rakes and hand rakes on many occasions and was an all-around handy man, a craftsman in many lines. Farmers in the early days had to do many things which today are done in factories. They had to do these things or do without these conveniences. (mother) Mary MacLean, born 1823 in Big Brook (now Lorne), Nova Scotia, lived all her life on her father’s farm and died in 1902. She is buried, with her husband, at the Lorne Cemetery right on their property. 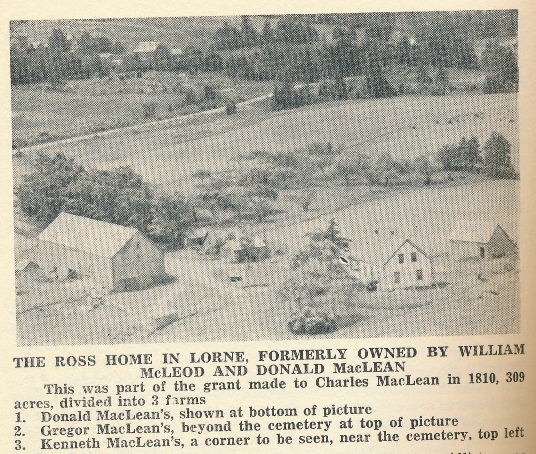 The picture is from page 192 of the book, the farm where they lived, in Lorne, Nova Scotia. 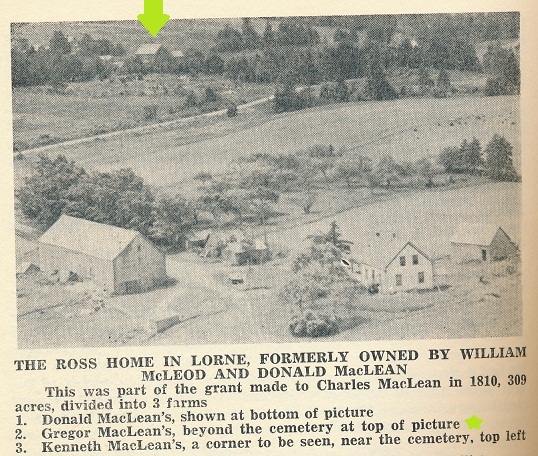 Note that Lorne Cemetery is on this property, toward the top of the picture. (sister) Christy Ann MacLeod, was born in 1848 in Big Brook. She married John Ross in 1871 and the couple lived on her family’s farm. They had five children, William Allister Ross, Daniel Keith Ross (the author of the book), Charles Simons Ross, Elizabeth Mary Ross, and Catherine Jessie Ross. 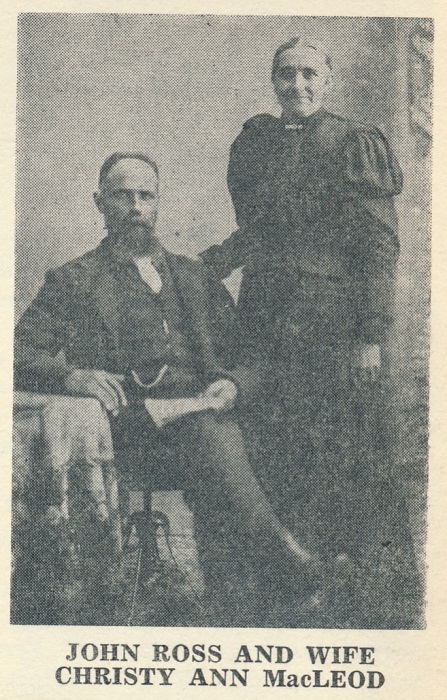 sister Christy Ann MacLeod and her husband, John Ross, from page 193. Alexander “Alex” MacLeod was born in Tea Gate, Kiltarlity, Inverness-shire, Scotland, the oldest of seven children born to William MacLeod and Margaret McKay, who never left Scotland. Alexander brought his wife and first four children from Scotland to Pictou in 1832 and settled at Middle River (now Glengarry), where seven additional children were born. Later, they moved to Lorne. Ann “Annie” Fraser was born in Beauly (or Beuly), near Kiltarlity, and with her husband Alex and children, came to Pictou in 1832. 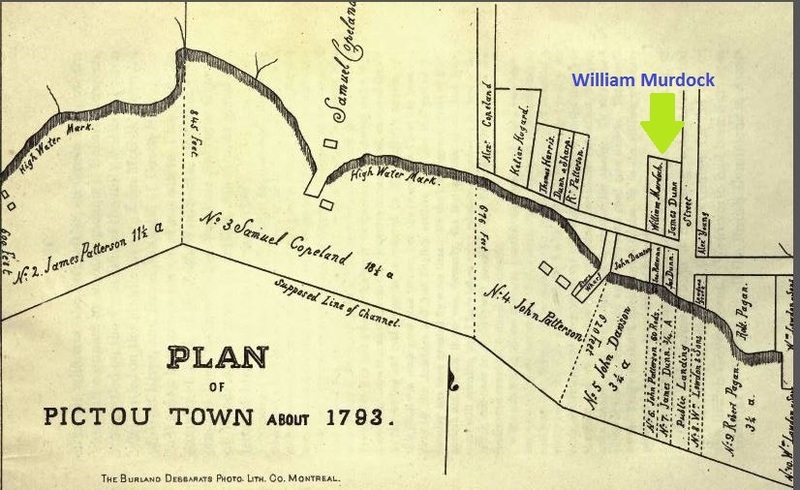 When they moved, later, from Middle River to Lorne, they settled on the property of William Fraser, who had rather illustrious roots in Beauly, connected to the local castle, and had arrived in Pictou in 1800. Her relationship to these Frasers is not clear to me. Annie and Alex may be buried at St. Columba Cemetery, Hopewell, Pictou. from the book, page 158: Annie Fraser, the Scottish lassie from Beuly was the mother of eleven children and instilled in their minds and hearts the knowledge of God and a love of the church and of family religion in the home. Donald MacLean was born around 1800 either in Scotland or Pictou. Donald’s parent, Charles MacLean and Marjory McKay, had come from Scotland around 1800. His father, Charles MacLean, was granted 309 acres of land in Big Brook (later Lorne) in 1810, and that property (pictured above) was later split among the three sons. Donald was on the roll of the West Branch Church (now called St. Columba) in 1853. He may have died around 1871. Elizabeth “Betsy” MacMillan was born in 1798, probably in Irish Mountain, Pictou. Donald and Betsy’s only child, Mary, was born in 1823. She was the daughter of John MacMillan and Mary Grant. She had a brother, Finlay MacMillan, who married her husband’s sister, Isabel MacLean. Donald and Betsy lived for many years on the MacLean family farm which was eventually run by their son in law, William MacLeod. Along about now, my family members are getting VERY confused, because my FATHER’S family are all MacLean’s and MacLeod’s going back many generations. But they are from Cape Breton, Nova Scotia, and so far, I’m not spotting much of a real connection. Jessie Ruth had three children: (1)Eva Louise, b. 1883 – Eva was an extremely popular name, and I think Louise may have been given in honor of the father, Louis. (2)Mary Christine, b. 1886 – those are the names of Jessie’s adopted mother, Mary, and sister, Christy – I should have realized those names were clues. If I had searched census records for Mary MacLeod or Christine MacLeod in Pictou that might have helped me. (3)Jessie Ellen, b. 1889 – OK, we know where the Jessie comes from, but where does Ellen come from? I suspect “Ellen” is a further clue. I keep thinking, how would I ever, ever, have found this book. It’s not even in the Family History Library in Salt Lake City [UPDATE it is in the FHL – it was the first thing I noticed in the Pictou section]. I really need to ponder this more … WorldCat.org shows it in about 10 libraries, mostly Canadian. 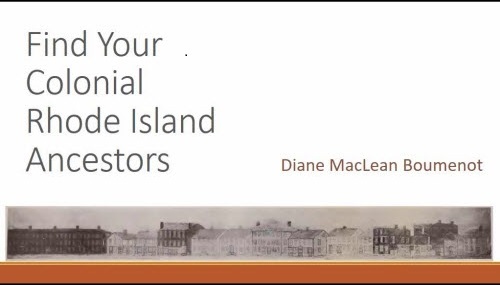 Had I looked up the history or biography classifications under Pictou, I would have found it along with dozens of other potentially helpful books. It is located in two locations I MIGHT have made it to someday – Allen County Public Library, and the college at Wolfville, Nova Scotia, where I have other family. Note to me – am I using WorldCat enough? Over the last few years I have made a lot of progress on tracing my mother’s family. Over the next year or two I hope to do some research on ten problems I’ve identified. I am recording them here, and I will provide links, in the future, to any postings I do about each one. What surprised me about this list is the huge range of skills and strategies that I would need to pursue these questions. Searching in accessible resources and repositories has helped, but not solved these problems. This is where research really begins. None of these are easy, but working on them will be a real education. 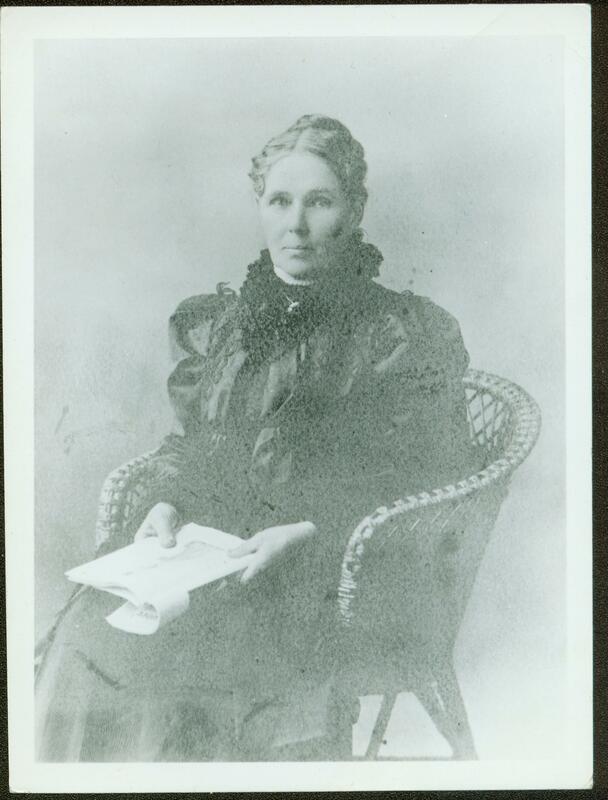 Jessie Ruth McLeod was born March 10, 1861 in Pictou, Nova Scotia. She is my great great grandmother along the all-female line. Her marriage certificate lists her parents as William and Rachel McLeod. She arrived in the U.S. around 1881. There is no evidence of her coming with close family, but it’s hard to believe she came without family or friends at all. Her subsequent life I know all about, but this is all I have of her family origins. I have only one possible match in the Canadian census, and the only other clue is that her eventual father in law, William Murdock, had also come from Pictou, much earlier. Skills needed: Make timeline for her, try once again to learn more about her father in law’s Pictou family, and explore naturalization records in Massachusetts. Re-explore family records for clues. Worcester Daily Spy, 03 May 1894. 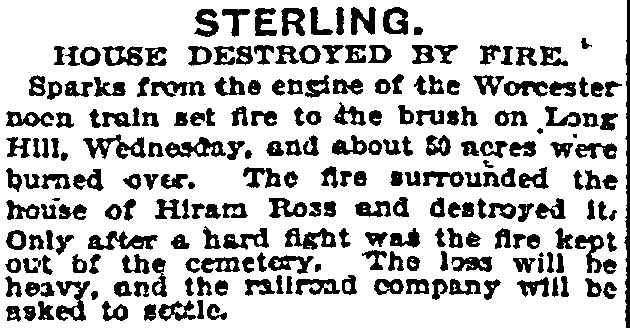 Catherine and third husband, Hiram Ross, lost their house in a fire in Sterling, Mass. Another great-great-grandmother, Catherine Youngs, is the kind of mystery woman a person could chase for decades. Born in Surrey, England, perhaps on 4 Jul 1835, Catherine arrived in the U.S. around 1843. On one marriage certificate she lists her parents as William and Catherine Youngs. On another, she lists them as “unknown.” Three of her children thought her maiden name was Youngs, and one thought it was Spaulding. She was married three times, to Bennett, Baldwin, and Ross. After her marriage to Hiram Ross in 1870, I know a great deal about her. Before that, very little. Her first home in the U.S. could have been Massachusetts or New York, or someplace else. If she came with family, I know nothing about them. Skills needed: Analyze all data reported by her and by others about her, look for other British citizens in Allegany County, New York, explore early British census and vital records, explore U.S. immigration and naturalization records in Massachusetts and New York, look for the first husband William Bennett using methods appropriate for common name searches, and talk to my mother about the idea that her father could have been wrong about his grandmother’s maiden name being Spaulding. 3. Maria (Shipley) Martin, 1848 – ? The problem with yet another great great grandmother, Maria Shipley, is almost the opposite problem. Born in Wolfville, Nova Scotia around 1841, I know a great deal about her Shipley/Innis/Dougherty/Bransby/Munroe ancestors. She came to the U.S. around 1885 with her husband and children, and at least one sister. But after her daughter’s wedding in 1892 in Milton, Massachusetts, at which time she seems to be separated from her husband, I have no knowledge of her. So I would like to know more. Skills needed: Find local newspapers for any town she might have been living in. Pin down locations and circumstances for each relative I know of in Massachusetts, which would be her estranged husband, her six children, her sister, and a niece. Anna Jean in Montreal. Perhaps around 1880? My grandfather’s aunt Anna Jean Bennett was born in Belmont, New York in 1854 and her parents seem to have divorced, perhaps, soon after. By 1860 she was living with her mother and stepfather in Belmont, in obscure poverty. In 1873 she married a Boston druggist, Harrison Gilley. They divorced at some point and in 1884 she married a Providence attorney, William Wilberforce Douglas, who became a judge and, eventually, Chief Justice of the R.I. Supreme Court. From 1884 on, I am very familiar with her life. But other than that first marriage record, I have no idea what happened to her from 1860 to 1884. 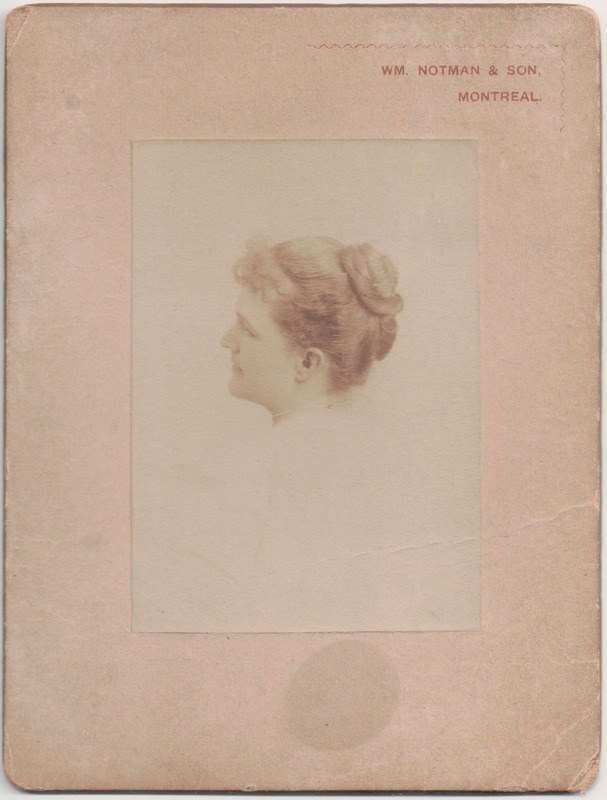 The lovely photographic portrait of her above was taken in Montreal during this period. Her brother was a globe-trotting artist. Who was her father (named William Bennett)? I would like to know her story, which I suspect is fascinating. Skills needed: Learn more about Canadian border crossings for this time period, as well as Montreal resources such as newspapers, employment records, city directories, high schools, art. Try to find her in the 1870/71 census, and 1880/81, possibly living with her father in the U.S. or Canada, using searches on multiple members of the family, since her father and brother have very common names. Since the first husband was from Boston, use city directories to pin down his locations over many years. Review all later artifacts, documents and photos for additional clues. Hannah Andrews, my ggg-grandmother, was born in Massachusetts or Connecticut around 1819. She has a brother Alden and her parents’ names may be Jesse and Sarah Andrews. She married Russell Lamphere, Jr. in 1838 in Preston, Connecticut. There were a number of Andrews who moved from northeastern Massachusetts to Preston about 130 years before Hannah was born. But Hannah may actually have been born in Massachusetts. Her brother married a girl from Springfield, Mass. I can find no sign of her parents – I wonder if they died young. Skills needed: do another literature search, analyze known information, learn more about guardianship records just over the border in the central portion of southern Massachusetts and also in Preston. Explore church records for the church where they married. Daniel Lamphere is the father of my gggg-grandfather Russell Lamphere, Sr. The detail above from Daniel’s 1808 probate file, about his son Russell, is part of the substantial evidence of the branch back to Daniel. Daniel, from Westerly, is likely descended somehow from George Lamphere, an original settler of Westerly, R.I. But there were several Daniel Lampheres in the area at that time and it’s confusing, so, no luck so far. Skills needed: Learning more about all the people surrounding Daniel and his wife Nancy is the strategy I have started and plan to continue. Track down his Westerly deeds. Find out where he’s buried. 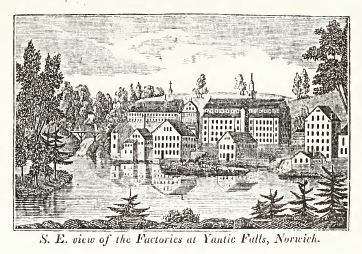 The Factories at Yantic Falls, Norwich, from “Connecticut Historical Collections” by John Warner Barber, 1836. Lydia Miner of Norwich, Connecticut, my gggg-grandmother, married Russell Lamphere, Sr. in 1807 in Norwich, CT. She passed away in Norwich in 1849. There is some suggestion she may have been born in Rhode Island, most likely just over the border in Westerly, like her husband. Miners originally settled the nearby southeastern corner of Connecticut. People familiar with the well-documented Miners/Minors think this problem should be easily solved, but so far, it hasn’t been. I believe Lydia and her husband were attracted by the growing factories in Norwich, since they lived in the Yantic Falls neighborhood. Of all of my family, they were among the earliest to abandon farming for industrial life. It’s possible that she and Russell met as factory hands, or that her father worked in an early factory. Skills needed: Local Yantic Falls history is likely to provide additional clues. Also, less easily accessed sources of local Westerly and Norwich information such as church records, town council records, the Connecticut State Library, cemetery records, and still more tracing of each of their children may help. Analyzing every available fact may bring up other possibilities. I would like to find where she and Russell are buried. Thomas’ father (Lieut. Thos.) 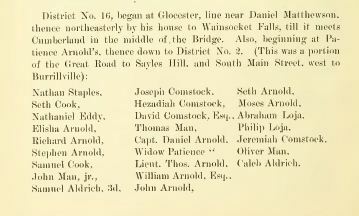 appears in a 1748 Highway District list, a good source to learn who the neighbors are, on page 30 of “History of the Town of Smithfield” by Thomas Steere, 1881. My ggggggg-grandfather Thomas Arnold comes from a well-documented Smithfield, Rhode Island family. But of course my branch is not so well documented. His wife, Rachel, might be a Smith. That possibility is repeated here and there with no evidence. I wonder if a concentrated look at deeds or other local records might help me determine Thomas’ association with nearby Smith families. Skills needed: Investigate town records from Smithfield and any deed connected with Thomas (who is not the only Thomas Arnold in that area). Continue to research each of the children. 9. Mercy (Ballou) Aldrich, 1778 – ? Working on Thomas Arnold, and local deeds, might help me figure out whatever happened to his granddaughter, my ggggg-grandmother Mercy Ballou, who divorced Nathan Aldrich in 1803. I have no knowledge of her life after that, but I would like to know what happened to her. Her former husband, and his second wife, sold property to her father after the divorce, and I believe they moved up the road to Wrentham, Mass after that. I am trying to pin down her father Richard Ballou’s property to find a location she may have returned to after her divorce. 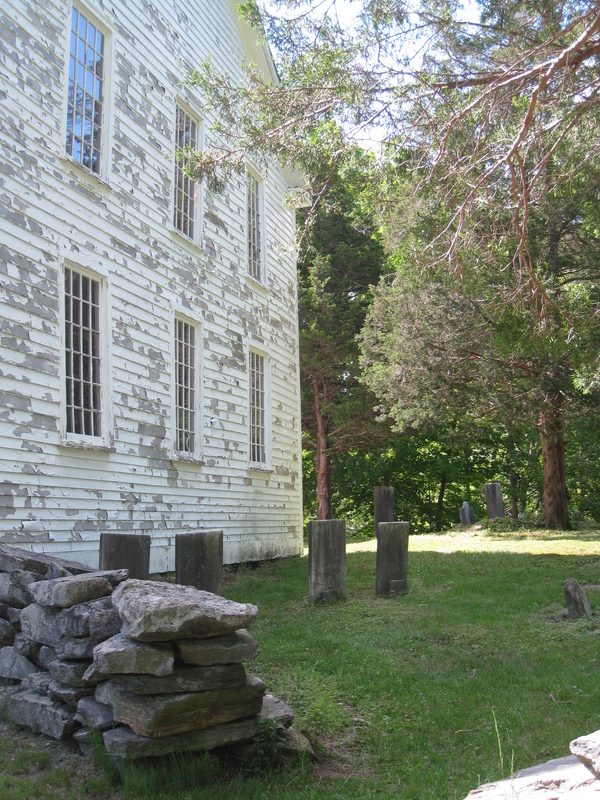 Skills needed: There are numerous small family cemeteries in Smithfield. I wonder if she could have been buried there. Her father’s 1824 will only mentions his wife and “lawful heirs”, no specifics. Knowing far more about her siblings might help. After leaving Alabama in the mid-1870’s, Russell ended up using his metalworking skills at the Oriental Mills, in Providence. This is the building (Union Paper) as it appears today. Of all the details of my ggg-grandfather Russell Lamphere‘s life that I don’t know, one thing that I am most curious about is his relationship with Connecticut Congressman John Turner Wait. Congressman Wait submitted a war reparations bill for Russell Lamphere three times in the 1880’s. What happened in Alabama that would have justified reparations, and why were they submitted by a Connecticut Congressman even though Russell and his family had moved from Alabama to Rhode Island? There is nothing in Congressman Wait’s rather illustrious family history that suggests a connection to either Russell’s wife or mother, and yet I suspect there is a connection, or at the very least, perhaps Mr. Wait left some papers. I am also learning a lot more about Tuscaloosa, Alabama during the Civil War. A kind reader approached NARA in Washington DC about any files connected to Russell’s war claims. Staff did some substantial searching; it wasn’t perfunctory. So I feel fairly confident there is nothing to be found there. I need to move on. I have a half-formed idea that studying Congressman Wait’s complete genealogy will reveal some answers to my own. Today I am honored to have a guest blogger, my Uncle Ken. A graduate of Brown University and the Harvard Divinity School, Kenneth Torquil MacLean has served for over 50 years as a Unitarian minister, 20 of them at the Cedar Lane UU Church in Bethesda, Maryland. An inspired speaker, always fascinated with the human experience, Ken gave this sermon about our Nova Scotia roots on October 18, 2009. I cannot claim that my people came from Scotland to Nova Scotia on the Hector, for I do not know that, and the Hector is like the Mayflower is for many Americans, a source of pride because their people got here first. The Hector sailed from Scotland to Pictou, Nova Scotia in 1773 with 189 passengers. Pictou is a small seaport on the north coast of Nova Scotia, and when I visited there in September with Terry and my brother and three members of his family, we were fascinated to see an accurate replica of the Hector there in the harbor and a museum which tells a great deal of what it was like to have been one of the passengers on that voyage. Things were tough in Scotland in those days. Most people were tenants on the land of the great landowners, and very much at the mercy of those wealthy nobility. There were great changes in the economy of the country, there was the conversion from tenant farming to devoting the land to pasturage for sheep, and there was a great scarcity of food which amounted to famine in some areas. The prospect of a better life across the ocean led many families to scrape together the three pounds for their passage. They were told to bring a pound of oatmeal for each person, and some also brought some molasses or other condiment. For the first week or so, passengers were allowed on deck, and the weather was somewhat pleasant That soon switched to stormy seas, and all passengers were required to remain below deck for the remainder of the trip. Because they were blown off their course early on, they probably lost two weeks, and the whole voyage took twelve weeks. When we went below deck, the bunks, or shelves on which they were accommodated reminded me of the prison at Dachau. The captain provided them with water, but it was in very short supply, and the pound of oatmeal for each person had to be stretched pretty thin. There was no privacy, but they managed to subsist. Then it happened that some of the children contracted small pox. Most of the adults had already been through cow pox, and that left them immune to small pox, but the children were not so protected, and a number of them died, along with two adult women. The bodies were wrapped in sail cloth and sent to a watery grave. These brave pioneers were the vanguard of perhaps 40 thousand Scots, mostly from the Highlands and the islands off northwest Scotland who made their way to Nova Scotia, especially to Cape Breton Island from the 1770’s to the 1830’s and ’40’s. It was pointed out over and over that there were better land and greater opportunities in Upper Canada, but it was clear that they wanted to be with their own people, people who shared their religion and culture. The settlements they founded were either Roman Catholic or Presbyterian. They had brought little or nothing with them, and they were poor to begin with. They had been promised land along the coast and provisions to tide them over until they could provide their own, but the land they got was back in the forest, not near the coast. There were no provisions for them, and they were destitute. They were also tough. Life in the remoteness and wintry weather of the Scottish Highlands and the island had made them resourceful survivors. My people probably landed in Cape Breton in the 1820’s, and they came mostly from Lewis and Harris in the Outer Hebrides off the Scottish mainland. 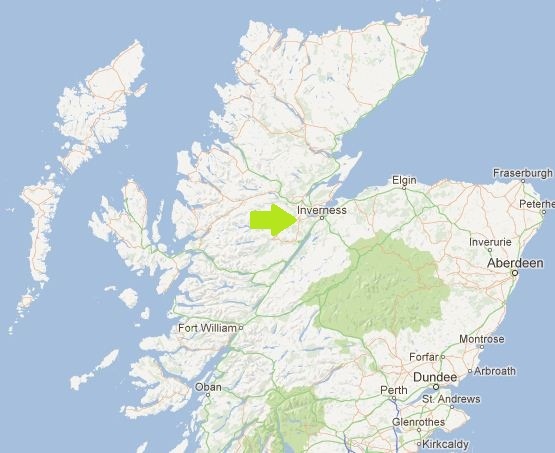 Lewis is the northern part and Harris is the southern part of one island. Harris is famous for its tweeds. Both sides of my family, the MacLeans and the MacLeods, settled in the village of Englishtown, along St. Ann’s Bay. Across the bay from Englishtown there is a sand bar which curves out into the water, solid enough to have a road built on it. And the Englishtown Ferry runs over to the end of that sand bar. The gap is not very wide, but there are very swift currents in it with a tide change every six hours. And Donald MacLean, with a dory would row a buggy and passengers across. The horse would usually have to swim behind the ferry and the passenger would hold the rope attached to the horse or tie it to the rail. Donald’s son Torquil took over from his father on the ferry, and he operated it for fifty years. It has now been in operation for at least 175 years and is named for Torquil, my grandfather. It will take fifteen cars at a time. Life in Cape Breton was not easy. The land was rocky for farming but not impossible, and the waters around them were full of fish and oysters and lobsters. Some of the early settlers had been given grants of land and others bought up pieces where they could. 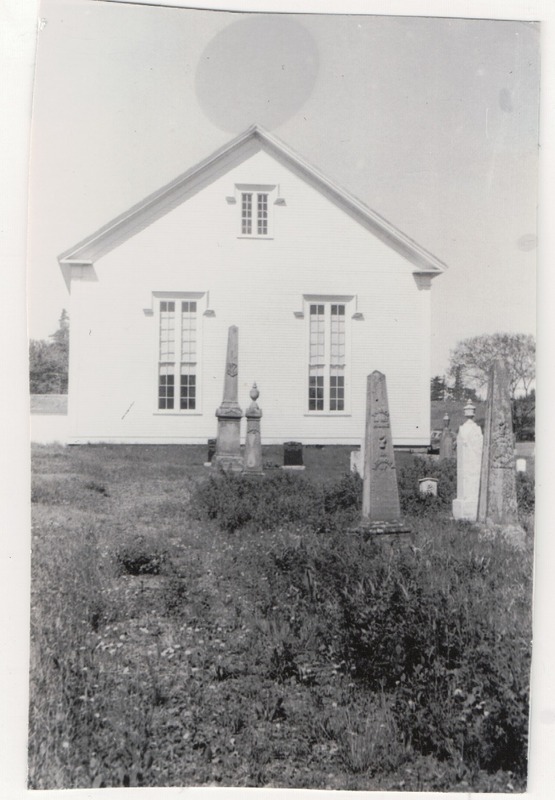 In the 1840’s a Presbyterian minister came from Scotland, first to Pictou and then to Saint Ann’s and Englishtown. Norman MacLeod was a charismatic, narrow, opinionated, powerful man who served the community as minister, schoolmaster, and magistrate. He would criticize people from the pulpit, as he did to his wife when she went to Sydney and bought a hat with ribbons on it. But when things got tough, and the crops were poor and the weather was terrible, he made sure that no one in his church community lost their land. They shared and helped each other. In the late 1840’s he decided that the whole community should move—to Australia! They had six ships built and altogether about 800 of his followers embarked on their sailing ships around Cape Horn, across the Pacific to Adelaide. My great-grand mother’s brother went and she stayed. Australia was having its gold rush and Norman MacLeod did not approve of what he saw there, so after a year they all moved to the North Island of New Zealand. Back in Englishtown one family nailed shut the door through which Norman MacLeod had come to say Goodbye. He was seventy years old, and they knew they would never see him again, so they decided that no one else should ever go through that door. Life went on in the very quiet community of Englishtown. Torquil and Sarah MacLean raised eleven children in the farmhouse near the ferry, and they all worked hard to store enough meat and vegetables to get them through the winter. They had five daughters in a row and then six sons in a row. My father used to tell of the man from the country who had to go to Sydney to see the eye doctor. When he returned, his friend asked him what the doctor had done. “He took my eyes out and polished them and put them back in,” he said. “He did not,” said his friend. “Sure and didn’t I see them sitting in the saucer looking at me? !” Life was hard in Englishtown, and a young man with any ambition would go away, to work in the mines, or sail on the Great Lakes, or join a steamship line on the Atlantic. Two of my uncles died in mining accidents, one was killed in England in the First World War, one drowned at sea, one disappeared from his ship in New York and was never heard from again. One stayed right there to become the captain of the Englishtown Ferry. My father became the youngest captain the United Fruit Company had ever had, but died young of an infection. My grandmother outlived five of her six sons. So this is the family story that my brother and I went exploring in Cape Breton last month, and thank you for your patience in listening to it. We visited cemeteries where some of our people, including my mother, are buried. We met cousins who were warm and welcoming. We saw the great beauty of that land and realized why my mother kept going back to Englishtown until her 98th year. We found books and museum exhibits that helped us to understand what our people had gone through and how they clung to their Scottish and Presbyterian identity, though they did not want to live in Scotland. Above all, we got a glimpse of the courage and strength they demonstrated over and over, and we hoped that some of these qualities came down the line. Tom Ahlburn, my poetic colleague who died two years ago, said that part of religion is knowing who we are. We can’t set out to become the people we want to be until we have some clear idea of who we are. And one way to begin to know who we are is to know who we came from, and what we are carrying with us from them. When my father died and I was the oldest of four children, my mother made the brave decision not to return to her family in Cape Breton. “The children were born here and they ought to grow up here,” she said. So we grew up a thousand miles from our roots, and we knew Cape Breton, “Down Home,” through my mother’s shared memories, and the letters and visit from family. Each of us had a trip to Nova Scotia when we were very young, and that gave us different images to keep and think about as we set about discovering who we were. I think of old Torquil, whose name I bear, rowing and pushing that heavy boat around, getting a horse into the boat and out the other end, or hanging on to the rope with the horse swimming at the other end. I think of my father, with eight years of a country school rising to be in command of a great ship at sea. I think of my grandmother, living almost all of her life in that house with a spinning wheel in the parlor but no indoor plumbing. I think of the cousins I never really got to know who had to face many of the same challenges that came in my life. 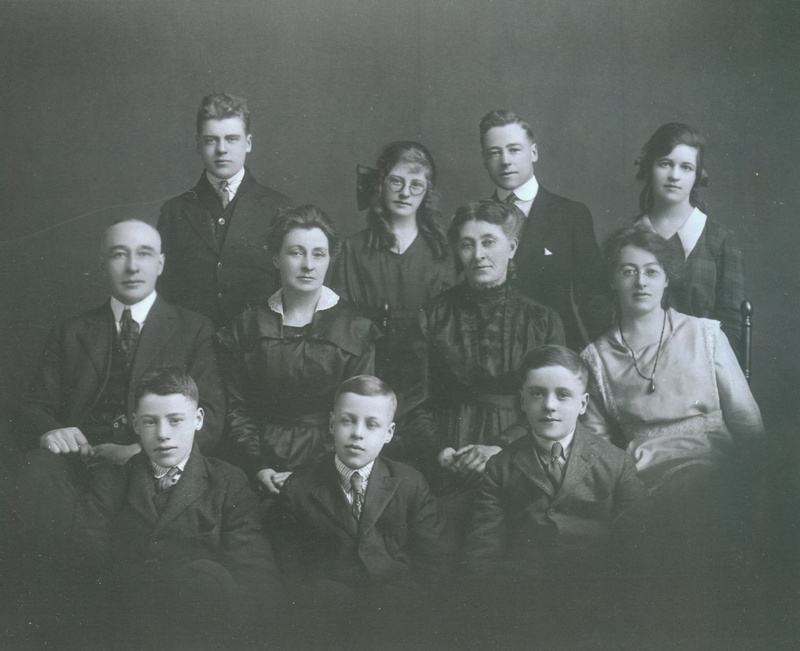 Kenneth and Sarah (MacLeod) MacLeod … with “Granny” Martha MacLeod & my Nana Josie in white … with their children. The groping for understanding goes on; it never ends. I always felt that I was different, but if I had known some of them, maybe I would have realized that in various ways they, too, were different. And what of your roots, the ones you knew at first hand and the ones you just heard about? Do they help you know who you are? Are there some wonderful people connected to you who have qualities you would like to have in equal measure? Are there some who help you by reminding you that you don’t want to be like them? We mostly grow up thinking that we ought to and will live forever. When you think about some of the people whom you have known well and who now are gone, does it bring you a sense of a complete life and a realization that one day our lives, too, will be complete? And is that scary or comforting, or both? It is not just the people I am fortunate to feel a sense of connection with, it is the places. When I go to Englishtown or North Sydney, where my mother grew up, I feel that connection to my roots. Seeing a beautiful seaside town in North Carolina or California may soothe the soul, but it is not connected; it is not my roots. In Englishtown, they may be in the cemeteries or on the ferry boat, but they are my roots, and they hold me close.